^ "The BBC Proms season has been announced, but how do I buy tickets? | Royal Albert Hall". Royal Albert Hall. Retrieved 22 March 2019. ^ "Day Promming | Royal Albert Hall". Royal Albert Hall. Retrieved 22 March 2019. ^ Andrew Clements (17 July 2014). "Start of Proms marks end of Roger Wright's tenure as director". The Guardian. Retrieved 7 June 2015. ^ "David Pickard named as Director, BBC Proms" (Press release). BBC. 26 May 2015. Retrieved 2 June 2015. ^ a b John Plunkett (26 May 2015). "Glyndebourne chief David Pickard to head BBC Proms". The Guardian. Retrieved 7 June 2015. ^ Fiona Maddocks (27 July 2013). "Proms 14 & 15: Das Rheingold/Die Walküre – review". The Observer. Retrieved 16 August 2017. ^ Fiona Maddocks (6 September 2013). "Marin Alsop, conductor of Last Night of the Proms, on sexism in classical music". The Guardian. Retrieved 1 January 2019. ^ "John Drummond (arts administrator) - Wikipedia". en.m.wikipedia.org. Retrieved 22 March 2019. ^ Barry Millington (31 July 2017). 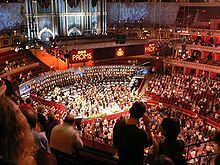 "Proms 2017, review: BBCNOW / Zhang". Evening Standard. Retrieved 16 August 2017. ^ Breckenfield, Nick. "Prom 3: BBC Young Musician 40th Anniversary". Classical Source. Retrieved 1 January 2019. ^ Cannadine, David (May 2008). "The 'Last Night of the Proms' in historical perspective". Historical Research. 81 (212): 315–349. doi:10.1111/j.1468-2281.2008.00466.x. Archived from the original on 5 January 2013. Retrieved 7 September 2009. ^ "Proms in the Park, Hyde Park". BBC Music Events. Retrieved 22 March 2019. ^ "BBC: Belfast Proms in Park is 'different concert' to Royal Albert Hall". www.newsletter.co.uk. Retrieved 22 March 2019. ^ Akerstedt, Ida (12 September 2017). "'Pandering to separatists' BBC under fire as Scots DENIED patriotic British songs at Proms". Express.co.uk. Retrieved 22 March 2019. ^ "Arts: Proms in the Park: for the first time. Tonight's the night..." The Independent. 14 September 1996. Retrieved 22 March 2019. ^ "Albert Hall link with Last Night of the Proms". The Northern Echo. Retrieved 22 March 2019. ^ "BBC - Press Office - Proms 2002". www.bbc.co.uk. Retrieved 22 March 2019. ^ "BBC - Press Office - Last Night of the Proms". www.bbc.co.uk. Retrieved 22 March 2019. 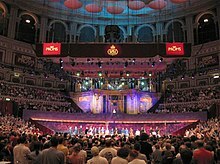 ^ "BBC Proms in the Park Feeds 40,000 with Martin Line Array - ETNow.com". www.etnow.com. Retrieved 22 March 2019. ^ "BBC - Press Office - Corrs at Proms in the Park". www.bbc.co.uk. Retrieved 22 March 2019. ^ "BBC - Manchester - Entertainment - BBC Proms in the Park". www.bbc.co.uk. Retrieved 22 March 2019. ^ "BBC - Press Office - BBC Proms 2007: BBC Proms In The Park". www.bbc.co.uk. Retrieved 22 March 2019. ^ "BBC - Press Office - BBC Proms 2008: BBC Proms In The Park". www.bbc.co.uk. Retrieved 22 March 2019. ^ "BBC - Press Office - Belfast Proms In The Park 2008". www.bbc.co.uk. Retrieved 22 March 2019. ^ "2009, Proms in the Park - BBC Two". BBC. Retrieved 22 March 2019. ^ "BBC Radio 3 - BBC Proms, 2010, Proms in the Park, County Down, Part One". BBC. Retrieved 22 March 2019. ^ "BBC Radio 3 - BBC Proms, 2010, Proms in the Park, Salford, Part One". BBC. Retrieved 22 March 2019. ^ "BBC Radio 3 - BBC Proms, 2009, Proms in the Park, Salford, Part One". BBC. Retrieved 22 March 2019. ^ "BBC Two - Proms in the Park, 2011, Last Night at the Proms: Scotland". BBC. Retrieved 22 March 2019. ^ "City reclaims Proms in the Park". 18 April 2011. Retrieved 22 March 2019. ^ "BBC - Thousands flock to BBC Proms in the Park in Bangor - Media Centre". www.bbc.co.uk. Retrieved 22 March 2019. ^ "BBC Proms in the Park London". BBC Music Events. Retrieved 22 March 2019. ^ "BBC Proms in the Park Northern Ireland". BBC Music Events. Retrieved 22 March 2019. ^ "BBC's Proms in the Park to return to Colwyn Bay". North Wales Pioneer. Retrieved 22 March 2019. ^ Gibbons, By Fiachra; Correspondent, Arts (30 April 1999). "Rule Britannia pipes down as Celtic voice rises to take stage at the proms". The Guardian. ISSN 0261-3077. Retrieved 22 March 2019. ^ "BBC Proms in the Park cancelled after torrential rain in Caerphilly". Caerphilly Observer. 10 September 2011. Retrieved 22 March 2019.